I couldn&apos;t see what was making the sound, but the pitter-patter of paws approached from across the optional teak cockpit sole. Then the first mate, a four-legged friend named Willow, barked hello and welcomed me aboard Off.Line, a Symbol 59 Classic Pilothouse. With a greeting like that, I knew the test was going to go well. 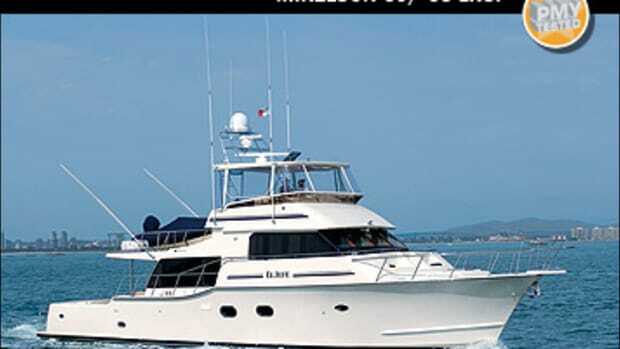 Following Willow was Philip Tyson, a former Cruisers Yachts dealer and an eight-time boat owner who, with his wife Susan, was getting ready to settle into a couple years of the liveaboard cruising lifestyle. I could tell from the high-gloss adjustable custom cockpit table, which was complete with a Caribbean islands design in the tabletop, that this duo does some real voyaging. 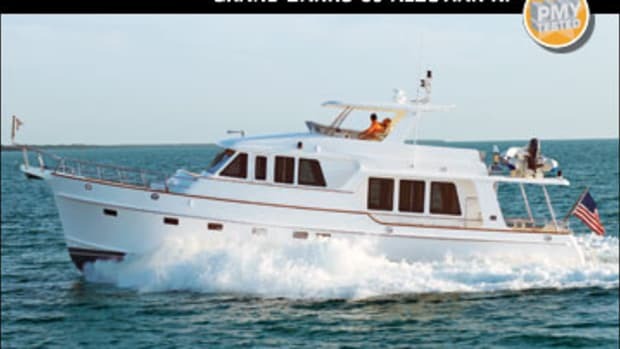 In fact, Philip informed me that starting this fall, the boat would be traversing said island chain and perhaps spending some time in Turks & Caicos, where the couple has purchased property. 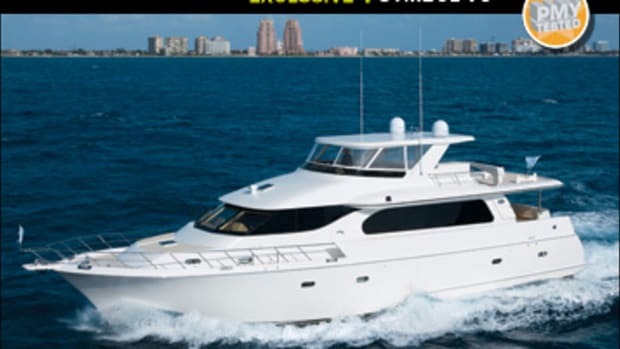 It was the desire for this kind of travel and liveaboard comfort that led the Tysons to Symbol. 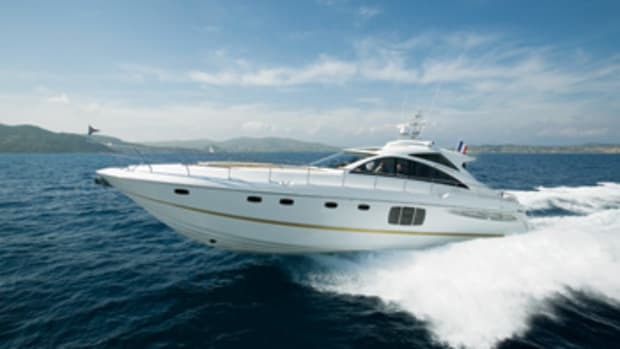 Comfort in such tropical climates would be key, and that&apos;s what I felt when I stepped through the double stainless steel sliding-glass doors leading from the cockpit into the saloon and felt the first (and literal) blast of comfort in the form of nearly 100,000 frosty Btus of Marine Air air conditioning. Even though the saloon sports seven-foot headroom, it still felt cozy and inviting thanks to the warmth of standard satin-finish cherrywood. This wood is also found throughout the galley up and bridge deck. Other woods from traditional teak to the more exotic wenge are also available in a variety of finishes. This space also sports an L-shape settee for lazy Sundays and a hi-lo table that sits atop an optional carpet almost as fuzzy as Willow. The table had been customized to have two roll-out seats stored in slots under each end of it. The seat tops also flip open to reveal dry dog-food stowage for extended trips. Stowage is a big part of life onboard this boat and, considering the Tysons will likely spend most of the next two years living within the 60&apos;3" length and 17&apos;6" beam of Off.Line, they&apos;ll need plenty of it. They added cabinetry by swapping out the saloon&apos;s standard port-side barrel chairs. These cabinets run from a couple of feet in from the sliding-glass doors to just short of the custom-fit (and fully stocked) wine rack under the stairs leading to the flying bridge. 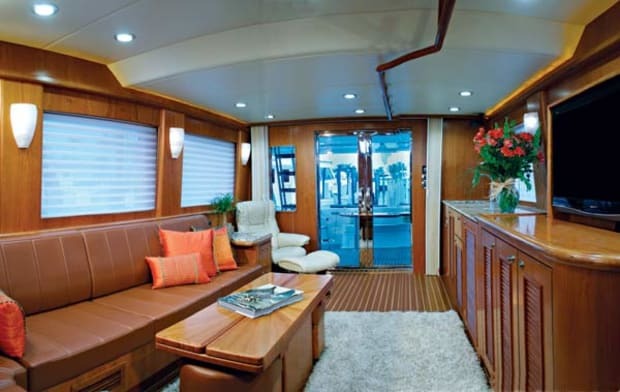 Adding the cabinets narrows the saloon, but since the interior was customized to the owners&apos; vision using a CAD program at Symbol&apos;s Fort Lauderdale-based dealer, Lucid Marine, they were aware of this fact going into the project. The Tysons&apos; personal touch can also be seen in the optional handpicked granite countertops in the saloon, galley, and heads. While the granite work on this 59 was completed stateside, it can be—and usually is—performed at the builder&apos;s Taiwan-based yard. As a matter of fact, Philip said if he was going to do it again, he&apos;d have a majority of this type of work done at the Symbol yard, which has been building boats for 25 years. He explained how he had the 59&apos;s Wesmar hydraulics installed post-delivery, which was a challenge once the mechanicals were already set up and the hull-to-deck joint buttoned up. Later, during my tour of the engine room, I noticed that while the hydraulics were well organized, system installation could have been neater had it been accomplished during the initial wire and hose runs and while the boat was open. With wide double boiler- and wok-capable counterspace, the galley is one of the larger food-prep areas I&apos;ve seen in a vessel in this size range. Susan, an avid at-sea cook who even has an optional flip-down Samsung LCD TV with satellite hookup here to watch cooking shows, told me that she wanted a galley where two people had room to work. To that end, the aft nonstructural galley bulkhead was moved back several inches to extend the counterspace. Since the Tysons do quite a bit of entertaining during their travels, this extra prep and serve space will come in handy. They&apos;re also big into barbecues, and have one—a Fire Magic complete with optional infrared for rotisserie cooking—mounted on the customized, full-beam-spanning flying bridge. It sits next to a two-burner gas grill, too. The fuel for the barbecue and grill is contained within composite tanks for safe transport and stowage. 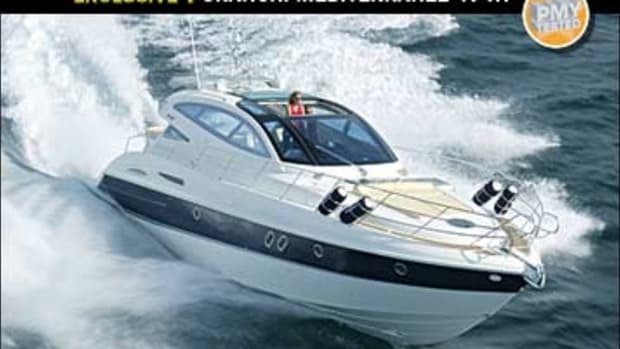 The weight of this gear is easily compensated for by the optional, relatively lightweight (just 350-pounds) Pipewelders foam-cored hardtop, which covers most of the flying bridge and the table just aft and to port of the upper helm. The table makes a great place for chicken and ribs. 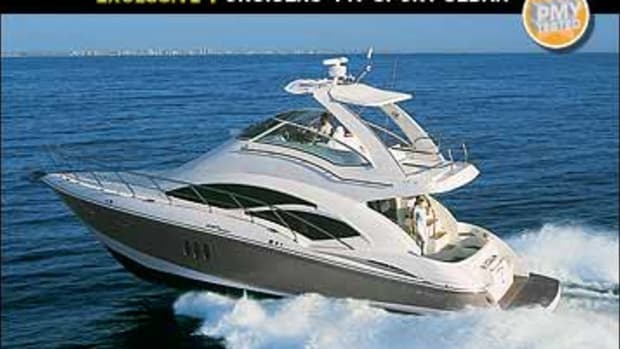 One thing you won&apos;t see on the flying bridge is Philip&apos;s beloved motorcycle or Susan&apos;s requested hot tub. These wish-list items fell to the axe of naval architect Jack Sarin. His wish-list item of stability won out. To ensure that Sarin&apos;s semidisplacement hull form lived up to the ride designed into it, Symbol built the 59 with a solid-fiberglass hull bottom and closed-cell high-density linear foam coring above the waterline and added two watertight bulkheads. The flat-calm conditions off Fort Lauderdale offered no opposition to this 85,000-pound, 59-footer, but they did help highlight the yacht&apos;s sporty side. While Philip prefers to cruise Off.Line at about 1100 rpm and 11 mph, the optional twin 800-hp Caterpillar C15 ACERT diesel inboards have the ability to take this voyager to a wide-open-throttle speed of 23 mph at 2320 rpm, which is within acceptable rpm tolerances. 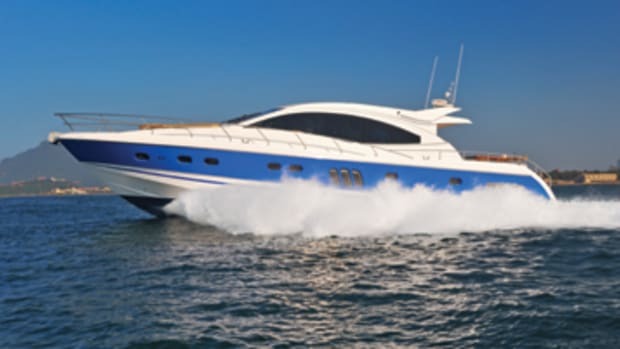 I found that during my wheel time, the vessel&apos;s Hynautic hydraulic power-assist steering was smooth at all speeds, and the three or so boat-length turns were without heel, helped by the optional Wesmar hydraulic stabilizers. These stabilizers remained on for the entire test and may have cost the 59 about 1 knot at the top end. According to Lucid Marine&apos;s Barin Cardenas, the 59 will run quite well sans stabilizers, and some are being ordered without them, too. 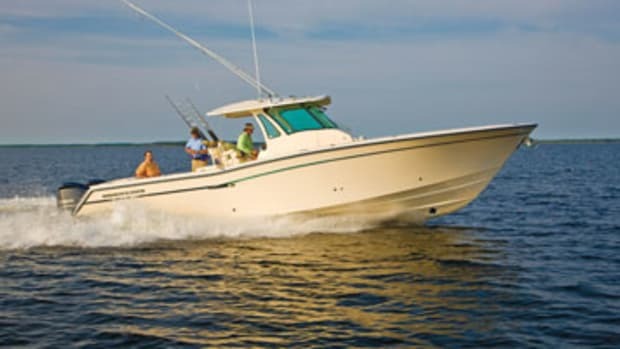 Our test boat also featured optional 25-hp Wesmar hydraulic bow and stern thrusters, which made spinning this boat and handling tough side-to conditions a breeze. The Tysons should have no problem bringing Off.Line into any port under most conditions. And any port is where you can take your 59. With the projected 11-mph cruise for this yacht, I calculated her range will come in around 800 miles, which is plenty, even for adventure seekers like the Tysons (and Willow). 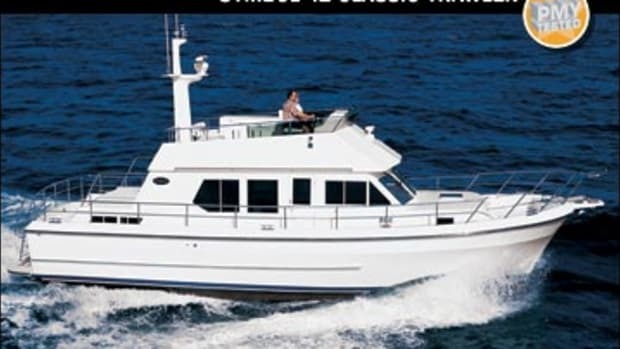 Combine this with a sturdy build, speed when you need it, and accommodations for six, plus pets, and you have a true liveaboard, go-anywhere passagemaker. The pitter-patter of paws followed me across the teak cockpit to the side-to boarding door as I finished my day onboard Off.Line. One final goodbye bark came as I took a last look at that custom cockpit table and I couldn&apos;t help but think that, in a year or so, the Tysons may need a bigger one to add all of the new islands they&apos;d visit. After all, that&apos;s what this couple, and this vessel, seem born to do. 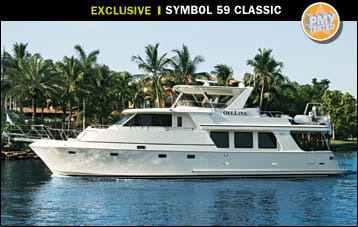 For more information on Symbol Yachts, including contact information, click here. Philip and Susan Tyson are “green” boaters. One way they decided to express their appreciation for the environment was to install these two solar panels on their hardtop. 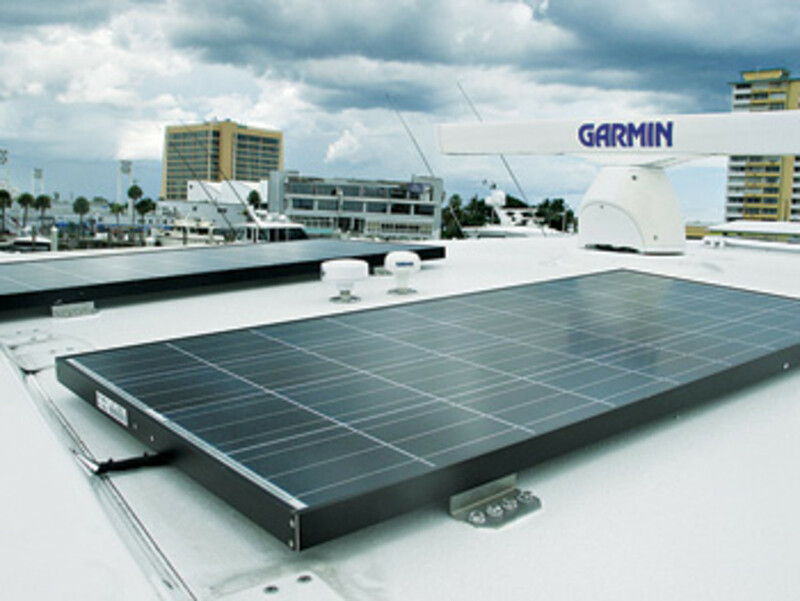 They measure about 5&apos;0"x2&apos;2" and can generate enough energy to allow the boat to run almost exclusively off her Xantrex inverter, which saves fuel and emissions that would have been generated by the two Northern Lights gensets. Heck, the Tysons don&apos;t even have to hook up to shore power if they don&apos;t want to. And there&apos;s another benefit: Philip says he thinks the system will also extend the life of his boat&apos;s batteries by as much as 50 percent.—P.S.